We provide high quality holiday themed entertainment. We have references. Do you need some family friendly entertainment to hop into your next Easter celebration and help out with the annual Easter egg hunt? Or are you looking for a certain furry character to advertise for the upcoming spring sale at your store? 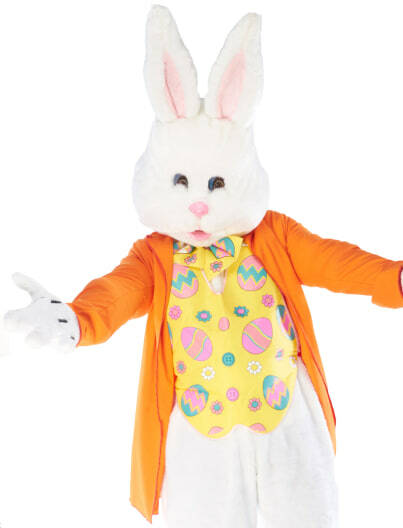 Look no further than this list of entertainers who want show up to any upcoming Easter or spring event of yours and wow everyone as the “real” Easter Bunny! Just make sure that you have some fresh carrots handy in case that fuzzy bunny needs something to munch on. Search for Easter Bunnies in Orange County, California above. Please note that these Easter Bunnies may also travel to East Irvine, Santa Ana Heights, Villa Park, Corona Del Mar, Newport Coast, Midway City, Laguna Woods, El Toro, Foothill Ranch, Atwood, Laguna Hills, Silverado, Aliso Viejo, Laguna Beach, Sunset Beach, Trabuco Canyon, Surfside, Los Alamitos, Las Flores, Seal Beach, La Palma, Rossmoor, Ladera Ranch, Hawaiian Gardens, Coto de Caza, Artesia, San Juan Capistrano, Dana Point, La Habra Heights, and Rowland Heights.